Time management can be one of the most difficult tasks for an entrepreneur, but it’s also one of the most important. When your earnings are dependent on getting stuff done, time wasted is revenue not earned. And in today’s world of constant distractions, it’s especially crucial to occasionally tune out social media, phone calls, emails and knocks on the door and use the time to complete vital tasks. 1. Remember the Milk is a task management tool which aims to organize your whole life, not just your work tasks. What’s really cool about this tool is that it integrates with Google Calendar, IMs, Twitter, Evernote and SMS. The idea here is that you will never forget an important task, since you will be reminded on any device you happen to be using at the time. 2. You can utilize Basecamp for your own use, but its real power is as a project management tool when multiple people are working together. Easily create and assign tasks, give them deadlines and receive emails when anyone comments on a thread or completes a task. You can use it on desktop and on your phone, so you know where each project stands at all times. 3. Integrate Basecamp with a time tracking tool like Freshbooks. Keeping track of time is important for staying on top of staff’s work hours and accomplishments. It’s also a great way to keep track of your own time, so you can see how much time you are actually spending on specific tasks and price your services accordingly. You can also see what’s taking up the bulk of your time and determine whether delegating these tasks might be time and cost-effective. An added bonus is that you are less likely to get distracted for long when you see a timer running at the bottom of your browser. 4. One of the simplest but most effective time management tools is an online calendar, such as Google Calendar. Many entrepreneurs make the mistake of only scheduling “interruptions” such as meetings, family events and phone calls. But what you really need to schedule is your actual work. Color-coding can be helpful for blocking off time in which you plan to work uninterrupted. If necessary, turn off phones and social media and devote your time to the task at hand to ensure you complete all the items listed on the day’s calendar. 5. Cold Turkey is an excellent app for turning off social media temporarily so you are not distracted by it. You can block any websites and apps you find are getting in your way, and the block will apply across browsers. If you have a set time in your schedule where you really need to concentrate, you can block that time off on a weekly basis until you cancel it. 6. Another way to minimize social media distractions is by using a social media scheduling service like Hootsuite. Instead of logging in to multiple sites, you control all your social media from one dashboard. Schedule time in your calendar to work on social media and schedule posts and tweets in advance. Check who has engaged with you and respond accordingly, then close the app and get on with your work. 7. To connect directly with customers and keep track of inventory, orders and sales, use a product like Salesforce. Save time searching for information; instead have all the data you need at your fingertips. Covering customer relationship management, marketing, data and analytics, Salesforce will make running your business much simpler. 8. Sick of sending documents back and forth via email, sorting through files to find the most recent version and wasting time in meetings drafting texts? Google Docs can save you lots of time by cutting out all that extra “paperwork.” Multiple people can work on the same document at separate times or together, and the app saves information about revisions, so you can see who made which changes and go back to an older version if necessary. 9. If you’re constantly coming across new ideas but losing them quickly, Evernote can keep you organized. With Evernote, you can take notes in writing, audio or in social media. You can easily organize your notes, so that finding that elusive light bulb moment is quick and easy. 10. I know, I know, it’s 2015… But sometimes pen and paper is the most efficient way to stay organized. Make a list of all the important tasks you need to get done each day and cross them off as you accomplish them. There is nothing more satisfying then drawing a line through a task you have finished. Anything that wasn’t crossed out is, of course, recopied to the top of the next day’s list. Keep a notebook with you at all times so you don’t lose your lists, and don’t forget to consult it at the beginning of each day. Staying organized sometimes finds itself at the bottom of our to-do list. But in the long-term, organization and time management are key to a successful business. 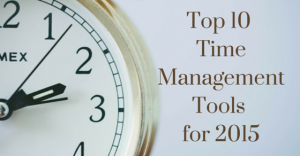 It’s worth putting some time aside at the beginning of 2015 to choose and set up tools which will save time throughout the entire year. Technology provides many challenges but it also provides solutions, so you can get a handle on all the various tasks you need to do on a daily/weekly/monthly basis and concentrate on what’s really important to your business. He seems innocent enough, that Cat in the Hat, with his crooked striped hat and necktie. But under the surface, he’s a very wily businessman. He knows “a lot of good tricks.” And we’ve come to blow his cover and “show them to you.” Ready? Tried all the diets out there and haven’t seen results? Lose weight but keep putting it back on? Feel like you’re doomed to be overweight forever but just can’t accept it? Now they feel you get them. Now you can move on to how you solve the problem. But our fish said, “No! No! Addressing objections is easy to do when you have a fish customer expressing them to you outright. As a savvy small business owner, the trick that puts you ahead of the game is anticipating in advance what the objections will be – and addressing them directly. What is your potential customer most likely to object to? How are they going to claim your product or service isn’t right for them? Address that in your marketing copy. A minor example is the ubiquitous “We promise not to sell, rent or give your email address to any 3rd party” notices that you often see at the bottom of sign-up forms. Companies asking for your email address know that you’ll be nervous about the fate of your email if you hand it over. “All I want is your freebie download. I don’t want to get hit with a ton of spam,” is your unstated concern. They know that. They address it. You feel better. You give over your email address. Done. What are your potential customers’ objections? Are they concerned about being trapped in a long-term subscription? Cancel easily anytime. Are they concerned about the product or service being hard to use and that they’ll be frustrated/won’t be able to take full advantage of what they paid for? Video tutorials/help section/support staff accessible by email/24-7 hotline. Are they concerned that the product won’t fit/look good on them? Learn from clothing manufacturer Black Milk who encourages its fans (of all different shapes and sizes) to share photos of themselves wearing Black Milk tights – and tag them with the product size. If you can’t do that, try a 60 day return policy – we even pay for your return shipping! Should you give up? Just go back and get a day job? Forget about being a small business owner? “I will NOT go away! No, that doesn’t mean being a pushy salesperson and trying to push former clients into doing business with you again. It DOES mean trying again. If your first product is a sales dud, learn from your mistakes. Why didn’t it work? What went wrong? How could you fix it? Be like these 5 well-known billionaires who had some spectacular business fails before they finally hit upon the recipe for success. Whatever you do, however, don’t leave a trail of unhappy customers behind you. If you made mistakes or under-delivered, don’t ignore the issues, don’t justify yourself, and don’t cover it up. “Oh dear!” said the cat. Oh dear. What a shame! In addition to ‘fessing up, make sure to put it right. Own your messes. Clean them up. The Cat in the Hat didn’t have to worry back in 1957 that “Sally and I” were going to tweet the world about what an annoying, irresponsible cat he was, crippling his ability to bring fun to other homes. As a business owner in 2015, you do. Try to ignore or cover up customer complaints? They’ll bite you back. Hard. On the other hand, if you acknowledge, apologize and make things right for the customer, you’ll make things right for your business too. Check out these great examples and a few more about companies that turned customer unhappiness into growth opportunities. That’s it. The Cat in the Hat is out of the bag. Take his tricks… and make them yours.